Rampaging TNT KaTropa stayed in the hunt for the No. 2 seed as it shook off stubborn Columbian Dyip, 101-98, for its fifth straight win in the 2019 Philippine Basketball Association Philippine Cup at the Ynares Center in Antipolo City last night. Columbian Dyip’s Rashawn McCarthy challenges three TNT defenders Yousef Taha, Brian Heruela and Troy Rosario in a PBA game won by the KaTropa, 101-98. Ace guard Jayson Castro led the Texters with his team-high 20 points and seven assists, while skipper Ryan Reyes and Troy Rosario each added 19 points for their team’s cause. The league’s hottest team improved to 7-3, still in third, but it can find its way to a possible No. 2 finish if it prevails its last assignment. At the moment, Rain or Shine holds the No. 2 ranking at 8-3, but the Tropang Texters, along with Barangay Ginebra, can still have a last-minute chase depending on their remaining assignments. As for the Dyip, the loss was a huge blow to their quarterfinals bid as they finished the eliminations at 4-7. It will now play the waiting game to see if it can possibly have a playoff for a ticket in the post-season. Leading for most of the way, mostly by double-digits, TNT KaTropa looked poise for a breezing finish but Columbian put up a gritty stand to threaten in the final minutes. Still, the Tropang Texters kept their composure to eventually pull through with the victory. Rashawn McCarthy’s triple with 48 seconds left capped off multiple runs from the Dyip, cutting TNT’s lead to only three, 101-98. Still with a chance to send the game to overtime, McCarthy, however, was forced by the Texters’ defense to misfire on his potential-tying trey at the buzzer. RR Pogoy added 14 more markers for TNT KaTropa. 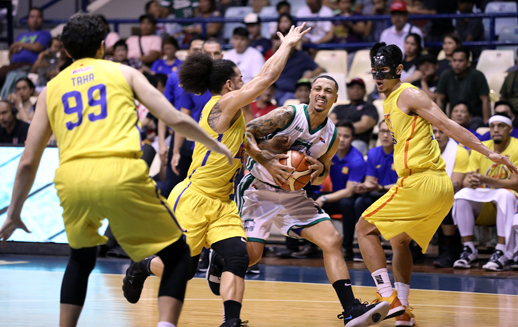 The Tropang Texters unloaded a vital 19-6 surge midway the second to suddenly turn the initially close game in their favor. Castro’s two free throws with 3:25 left in the first half capped that run and gave TNT KaTropa a comfortable 42-28 cushion. At the turn, TNT remained in control with a reduced 47-37 advantage. The Texters were still ahead 80-67 entering the fourth before the Dyip made their last hoorah down the stretch. CJ Perez led all scorers with a game-high 22 points.